It’s going to be a hot summer weekend in Kansas City this weekend, but it isn’t too late to grab a cooler, friends and family, and head out to Kauffman Stadium to see two of the best teams in baseball battle it out. 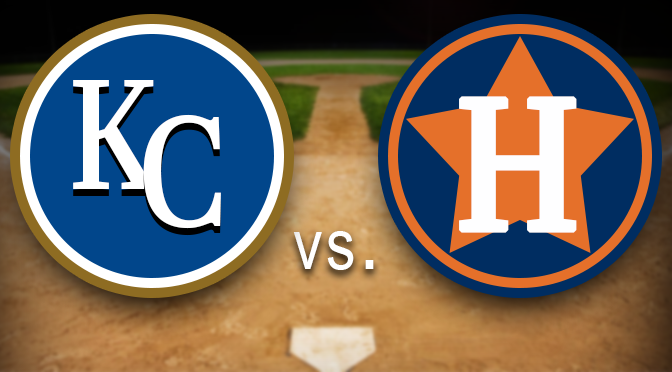 The Houston Astros, who signed Scott Kazmir from the Oakland A’s to bolster their roster as we head towards the postseason, will come to KC to take on the Royals after having pounded the AL Central leaders, earlier this season. The Royals are coming off a series win over Pittsburg, followed by a quick make-up game in St. Louis against the Cardinals before heading home. Unfortunately for Kansas City, Jason Vargas is headed for the season-ending disabled list due to a torn ligament in his elbow–requiring Tommy John surgery. Ned Yost said Thursday that he expects a 12-14 month recovery and rehab before Vargas will see the mound again for his team. The morning of Vargas’ injury, Kansas City designated Yordano Ventura for assignment in Omaha after a the roughest outing of his young career in game one against the Pirates. Ventura has struggled this season after taking the country by storm in the playoffs last season. More than anything, the designation for assignment may serve as a wake-up call to a young player trying to navigate his way through stardom and becoming the ace for a playoff team. Mostly, he is over-throwing and appears to be more concerned about what number shows up on the radar gun rather than pitching the ball and hitting his spots. Numerous times, Salvador Perez could be seen using the signal for slow down after Ventura’s throws, trying to get his pitcher to calm down and stay focused. Luckily for KC and Yost, the depth in the rotation is still relatively deep, and replacements can step in and take over for Vargas and help along Ventura as he finds his way before the season-end grind arrives. With the trade deadline approaching, teams in contention are making moves to improve themselves. Whether or not the Royals choose to do the same is uncertain, but pitcher Cole Hammels’ name has been thrown around frequently in the area as of late, and would likely require the Royals including closer Greg Holland in with a deal to get Hammels. General Manager Dayton Moore typically likes to use the offseason to make major moves with his organization, but with Vargas out and uncertainty surrounding Ventura, the addition of an experienced and seasoned starter could help secure the Royals’ rotation. Despite the scheduled heat-wave, Kauffman stadium is sure to be packed and full of energy this weekend with one baseball’s best teams in town to take on the Royals. For weekend day games, consider the sun sets behind the visitors side of the field, which would include sections 125-108. While the sun will certainly remain over the majority of the stadium seating, as the day winds down, the visitors side of the field will cool off quicker. Should you purchase tickets in section 200, which is lower level underneath the overhang, keep in mind the scoreboard may be partially cutoff by the overhang of the upper level. For the best seats and ticket packages for this weekend, visit Tickets For Less and choose from all three games!